Since his birth in 2010, I’ve wondered when we would start seeing our traits in him. Without the blood bond biological children share with their parents I’ve been anxious to see us in him in ways that must be distinctly learned. Along those lines, I’ve also been anxious to uncover the surprises we will find as he matures. Will there be a gait, posture or curiosity that is neither mom nor dad but then seconds later a stance or pose that is uniquely us? Like me, will he look foolish when he dances? When he says “Okedokee” will I hear my Nana? One of my favorite scenes in the movie Jaws is when Captain Brody is sitting at the table with his young son stewing over how best to save Amity Beach from the killer shark. Lost in his thoughts he takes a drink from his glass and looks up to see his son do the same. Quietly, he continues with a few hand movements and watches his son mimic him. It’s a silent game of Simon Says at the dining room table between father and son. 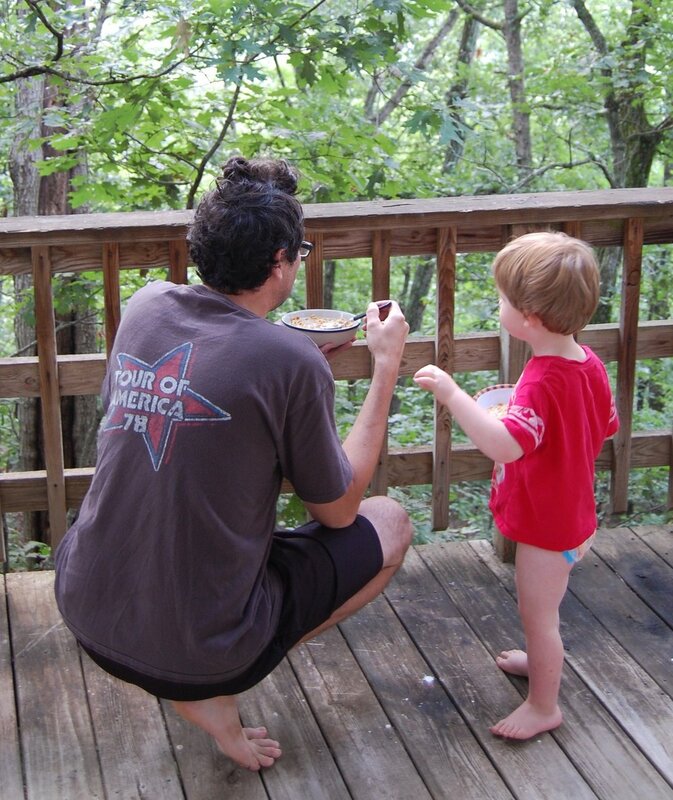 I had my first game of Simon Says with Judah this weekend while spending a few days in the Shenandoah Mountains with the family at a friend’s cabin. Breakfast one morning, the boy was eating Cheerios on a TV tray in the living room. I poured myself a bowl and took it outside to eat on the porch overlooking the woods. Silently, he left his spot and brought his bowl outside to eat, standing up and looking out over the mountains with me. In his world it must have been such a grown up thing to do. Eat outside. Barefoot. While standing up! In my world my son was a spitting image of me. Barefoot with bedhead and not a care in the world.